I love greens. 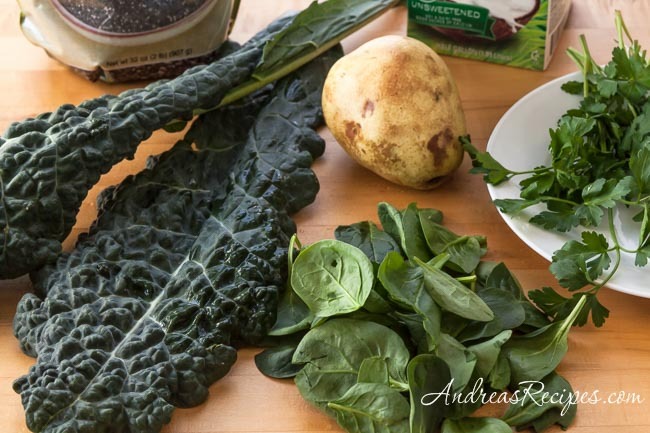 From the time I was a young girl and ate up my first serving of southern-style turnip greens with a splash of vinegar, I have loved my green vegetables. We grow our own chard, kale, arugula, and lettuces, though for some reason spinach doesn’t do well in our garden so we have to buy it. Our herb bed has parsley and cilantro, and we pick dandelion greens growing wild in the yard for summer salads. I like to eat my greens raw, lightly sautéed, or cooked in soup. But green smoothies and juices were another thing entirely. I adore fruit smoothies with yogurt, especially for breakfast in the summer, but when it comes to greens, I like the idea of chewing my food and enjoying it. It was going to take something really drastic to get me to drink my greens, like not being able to eat. In January 2013, the day after my birthday, I was told I had breast cancer. My family does not have a history of breast cancer, so this came as a complete shock. The next three months were a bit of a whirlwind, but somewhere in that timeframe I had tests, tests, surgery, and more tests. I was fortunate; it was invasive but we had caught it early. [Note: Ladies, get your mammograms.] Now I’m in the maintenance treatment portion, which involves injections and daily medications for five years. That’s the doctor’s part. My part is the exercise and food, and honestly food has been the hardest. Not because I had to fundamentally change how I cook; most of the stuff I cook is healthy to very healthy. For me, the problem has been the side effects. Some women sail through the maintenance treatments with few side effects, while others have side effects that make you wonder how you can get through five years of this. That has been my relationship with food for the last seven months. Some days I can’t tolerate cooking smells and it’s hard to even want food, even though my body needs it, and when that happens I make dinner for my family and retreat to another part of the house. But of course that doesn’t work well long-term. I needed to find things that I could tolerate and would nourish my tortured body, and that is how I turned to green smoothies. The first time wasn’t horrible, I just told myself it was chilled soup and sipped away. I realize that doesn’t sound like a ringing endorsement, but that’s where I was at the time. A week or so later, after I had made several green smoothies and was actually enjoying them, I poured some into a small glass for Michael so he could try it. His eyebrows arched as he took a sip and he said, “That’s an acquired taste.” That’s ok, because for me it’s absolutely true. I would not have chosen to do this if it weren’t for cancer. But now the green smoothies are a regular part of my routine, along with fruit and yogurt smoothies, and I usually feel better on the days I get my smoothies. And then on the days I am able to cook and eat our regular healthy food, I really enjoy it! To enable my green smoothie habit, I keep my favorite ingredients on hand and throw into the blender whatever sounds good at the moment. My body gets much-needed vitamins and minerals, and it’s easy. No funky smells on the days that my nose is in overdrive, my taste buds are off, or textures feel weird in my mouth. Now our refrigerator is regularly stocked with organic produce for my food treatment. And yes, I emphasize organic because to us it makes no sense to go through cancer treatment while getting produce with lots of pesticide residue. That’s counterintuitive. We grow as many of these as possible in our organic garden, and purchase the rest. Fortunately all of these items are easy to find in our area, even the chia seeds which I buy in bulk at Costco. I know the maple syrup may sound odd, and I actually don’t use it in my smoothies very often because very ripe pears and coconut milk serve as my usual sweeteners. However, on the days I need a taste bud adjustment, I’ll add a bit of maple syrup. If maple syrup isn’t your thing, try agave. 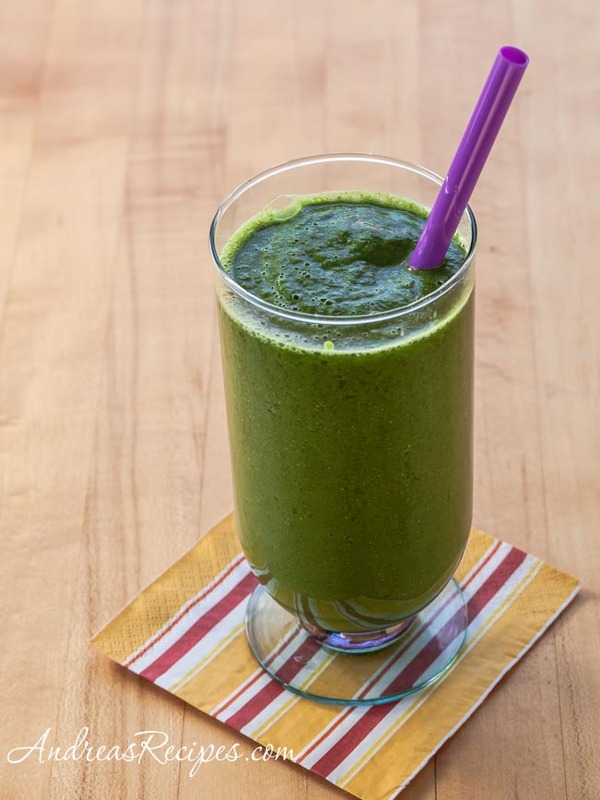 This green smoothie recipe is my favorite, the one I make most often. As mentioned above, I use either Lacinato (dinosaur kale, in photo) or curly kale, the two most common kinds you’ll find at the market. 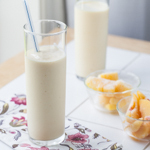 Both have a relatively mild flavor and play well with the other smoothie ingredients. Just make sure to strip away the tough stems and use only the leaves. The parsley and cilantro stems are tender, flavorful, and blend easily, so you can throw those in with the leaves. Very ripe pears are perfect for smoothies because they are naturally sweet and juicy, which is why that beautiful Anjou pear in the photo below has some brown spots. 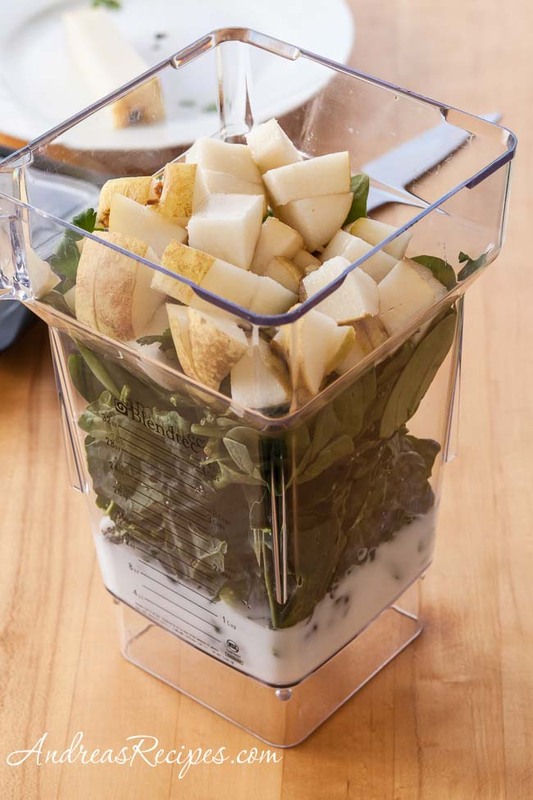 If you have a high-speed blender such as a Blendtec or Vitamix, they will make quick work of your smoothie. Other blenders will work well, too, old-style jar blenders just may take a little extra time, and you may need to remove the blender jar and stir down ingredients to get it to finish. I’ll share more of my favorite green and fruit yogurt smoothies in the coming months, as well as other foods that have been helpful in my cancer treatment. You can also find links to many healthy smoothies and juices on my Smoothies & Juices Pinterest board. Put all of the ingredients in your blender in the order recommended by the manufacturer. Blend well and drink immediately. You can use coconut water instead of coconut milk.